This next month will see many changes in local administration in France, as from the smallest commune to the largest city we are preparing for our local elections. The Maire and their team of councillors stand for a six year term of office and have the responsibility for decision making, budgets and local projects in the commune, among other things. The number of councillors and the voting rules change depending on the size of the commune and there have been some major changes to the voting system since the last elections in 2008. A small commune like ours (under 1000 voters) requires a team of 11 councillors (including the Maire) and the larger the commune the greater number of councillors. A person wishing to become the Maire puts together a list of the required number and registers his or her intent with the departmental prefecture. Although nothing has been announced in our village the local newspapers are starting to report the registered lists for some communes and in the next few weeks canvassing for votes will commence. The first round of voting takes place on Sunday 23rd March. 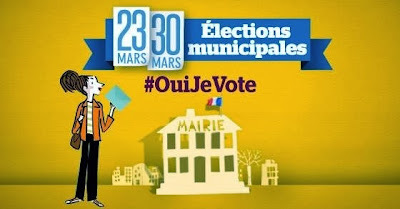 In order to vote you had to have registered at your Mairie by 31st December 2013. European foreigners (like us) can vote at local and European elections but not in the French presidential elections. Non-French nationals can stand for election, but only as a councillor as they may not hold the office of Maire. It is fairly common, especially in rural areas for British expats to represented on the local council and our village has had a British councillor since 2008. The French way of voting is very different from the UK system. In the UK, you receive a voting card with each of the candidates and you place a cross against the ONE you wish to vote for. In France you vote for a list of councillors. Voting takes place either at your Mairie or Salle des Fetes and on the day of voting you turn up with a piece of id which will be required to sign in. You will be given a printed list or lists of proposed teams. If you are happy with an entire list, you need do nothing more than place the printed list of 11 (or more depending on your commune size) in the envelope to vote. If you disagree with some of the choices you can cross off their names. For small communes, if there are two or more lists you may mix and match (panachage) between them, but only voting up to the maximum number on a list. Please note - this is no longer allowed in communes with over 1000 voters. Once you have sealed your envelope in secret, you place it in the ‘urn’ and you then sign out. Counting is carried out on site, in public, once voting has closed. If you wish to vote, but will be away on the day you can arrange a procuration or proxy vote at your local Gendarmerie. The other major change since 2008 is that it is no longer possible to add a name that doesn’t appear on a pre-registered list. Bizarre as it may seem, you used to be able to vote anyone from the commune onto the council whether they had agreed to stand or not! These votes will no longer count. If a list of the required number of councillors receives the majority vote on the first round they will be elected. If a majority vote is not reached for the required number of councillors there will be a second round of voting on Sunday 30th March. The elected councillors vote between themselves for the position of Maire and Deputies. I hope this has helped to explain some of the differences between the French and UK system.